Moles live almost entirely underground and are found throughout Britain wherever soil conditions allow for tunnelling and foraging for food. 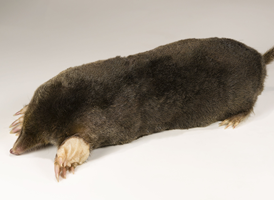 Moles have black velvety fur and large spade-like feet. They are typically 12-16 cm long. Mole hills. The most obvious signs of mole activity is the mounds of loose soil associated with mole activity. Possible sightings in the breeding season above ground. Mole hills and ridges spoil lawns and flower beds. Their tunnelling damages the roots of young plants and exposes stones and debris that can damage machinery. Cost - £108. This includes up to 3 visits over a 4 week period.